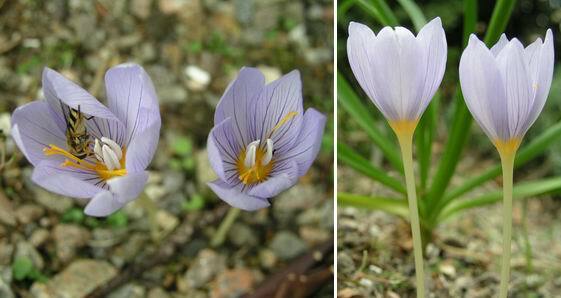 More crocuses are appearing every day now both under glass and in the open garden, like these Crocus pulchellus. We do not use labels in the open garden, we gave it up long ago as they always end up lying around the surface looking untidy; heaved out of the carefully placed position by some force of nature, usually with wings. As there are no labels to refer to I always need to get the bulb books out to remind myself of the different species and forms; by the end of the season I know them well but having to wait almost a year for them to flower again the memory lapses and needs refreshed. I never have trouble identifying Crocus speciosus which has just started to flower this week and we will get a progression of flowers until November with the various clones and the different conditions it grows in around the garden. I have also been playing with the image by using software to remove all the background and placing the subject to one side instead of in the centre of the frame. I am finding pictures like this are very useful when using the software program PowerPoint to create talks. 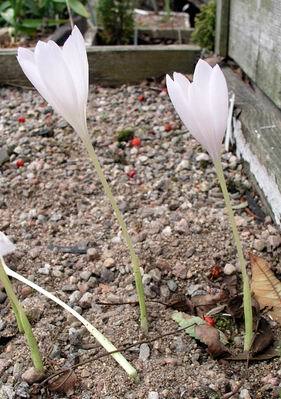 Some years ago we were given a great rarity, a white form of Crocus nudiflorus. When it first opens it has just a slight suffusion of purple at the base of the flower but it quickly fades to pure white. Like the usual form it also increases by stolons. It has been given the name Crocus nudiflorus 'Orla'. In the UK colchicums are often referred to as 'autumn crocus' this is very confusing to gardeners as, apart from a superficial similarity in the shape of flowers, they have no close relationship to crocus. Colchicum is a member of the Lily family and you can see (above left) it has six stamens and three styles, compare this to the crocus, a member of the Iridaceae, (on the right) which has a three stamens and a single style (which may branch into three or more parts), a quick count like this will always let you know if you have a colchicum or a crocus. 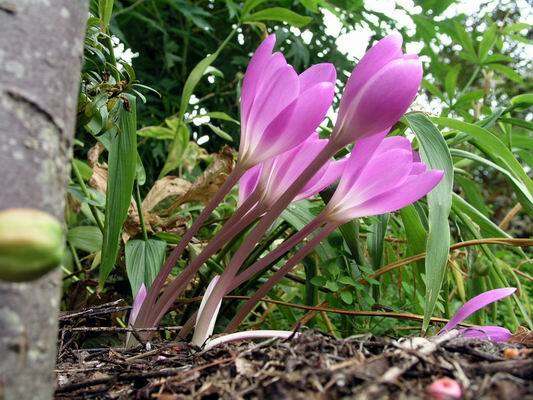 One lovely old garden plant of uncertain origin is Colchicum byzantium. 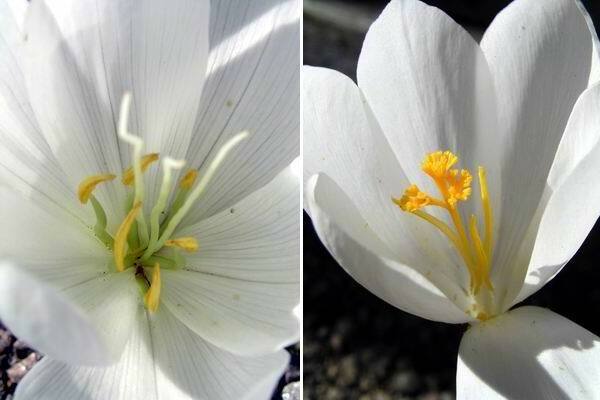 No record of its origin has been traced and there is some speculation that it could be a hybrid, this is the white form, Colchicum byzantium album, which has white flowers with purple tips. 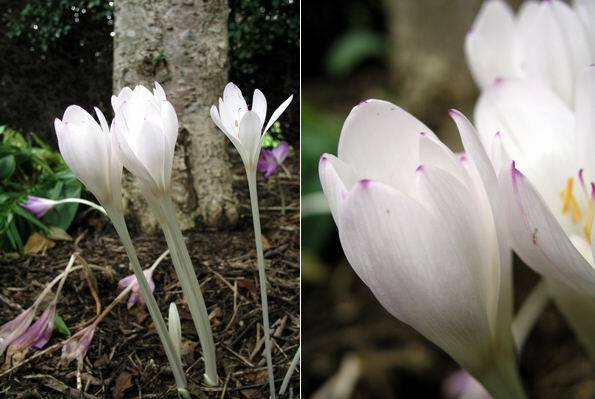 We plant the bigger colchicums close to the base of trees, where other plants would not be so happy. Then there is no problem with the spring leaves swamping out other plants. 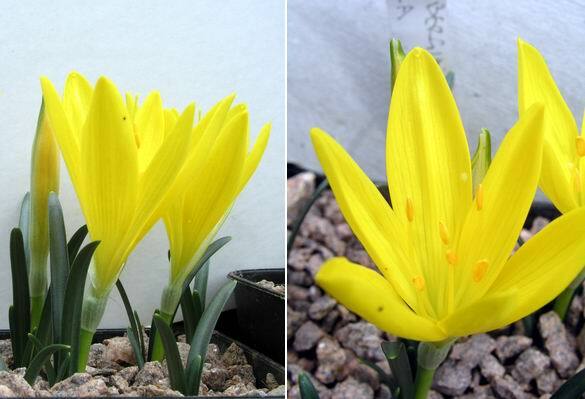 Sternbergia is another autumn flowering bulb that has crocus-like flowers. 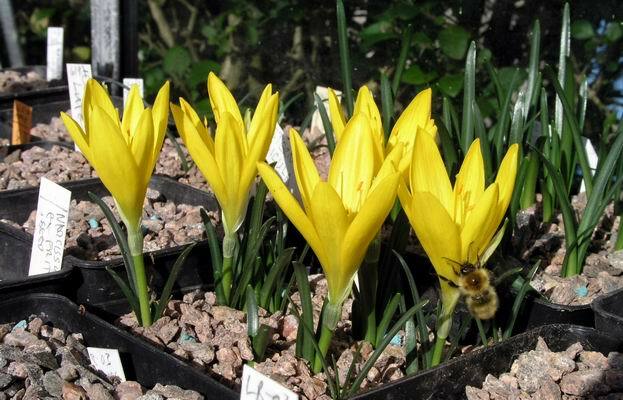 However the intense yellow flowers born on a short stem leave little room for confusion with Crocus and Colchicum. These flowers have six stamens and a single style but also notice that the ovary, the seed pod, is on top of the stem just below the flower; Sternbergia is in the Amaryllidaceae, the same family as Narcissus. Having given the bulbs their first 'storm' at the beginning of September, the majority of them will not require any more watering until the October 'storm'. If the weather is very warm I will water the sand plunge, if it looks like it is drying out, but I do not water the pots unless there are leaves. My general guide is to add water to the pot in proportion to the amount of leaves showing. These Sternbergias have strong leaf growth and will need plenty water to support this growth. Many crocus flower before their leaves appear and I do not add extra water to the pot until I see these leaves. 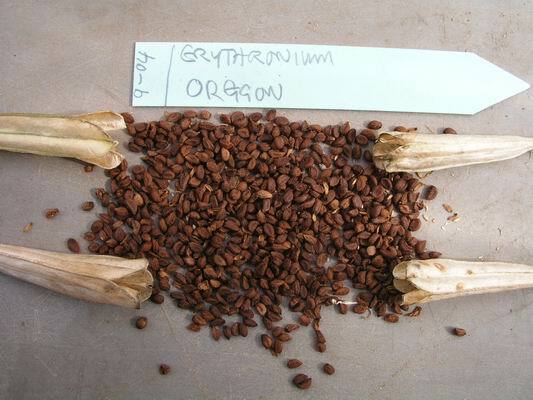 I am still working my way through sowing our own seed and I have now started on the Erythroniums. The seed has been stored in the pods which have been kept upside down to dry in a paper bag; my first job is to remove the seeds still remaining in the pods. I sow them quite thickly on the surface. I have not yet come to a decision on whether it is best to surface-sow Erythronium seeds or to sow them at depth, as I advise with Narcissus, Crocus etc. so I continue to surface-sow them until my experiments are concluded. I will say that my early results suggest that they should be surface-sown but I am repeating my trial to be sure and this will take up to three years. If you look from left to right you will see that the initial sowing is not very evenly distributed so I use tweezers to gently 'plough' the surface and this results in a more even spread of the seeds, the pot is topped off with gravel and placed in an open frame. 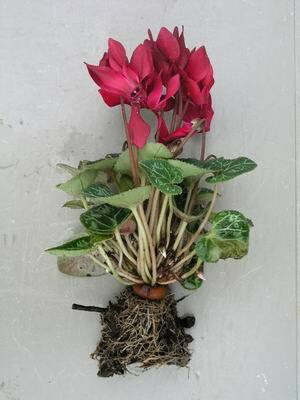 If Cyclamen had only leaves they would still be worth growing. These are leaves of some Cyclamen that we bought for a very reasonable price, for a polystyrene six pack, from a large home and garden type super store; we were tipped off about these bargains, a few weeks ago, by posts on the forum on this site. As with all growing plants that enter our garden I always wash off as much of the growing medium as I can, using a water jet. This means that we get the plant into a compost that we know and can control, plus, it lets you see just how healthy the root system is. Here is one of the washed off bargain cyclamen, it is one of the miniature Persicum cultivars that the plant breeders have created. Look how much growth and flowers they have produced from a small and not very old corm; quite a testament to the skill of these commercial cultivators.